11/13/2018 – COMSA Industrial is involved in a programme for preserving and studying the reproduction parameters of the European Roller in the region of Alt Empordà in Girona. Specifically, the engineering area of the COMSA Corporación group contributes, together with the Asociación de Amigos del Parque Natural dels Aiguamolls del Empordà (APNAE) and company Endesa, in the monitoring and controlling programmes of the European Roller population that migrates to this area in the spring. This specie has undergone a progressive decrease in its population, mainly due to the lack of natural nests, agricultural intensification and the use of pesticides. With the aim of applying preservation measures to enhance its habitat, Endesa, through its Biodiversity Conservation Plan, began the Coracias project in 2017. 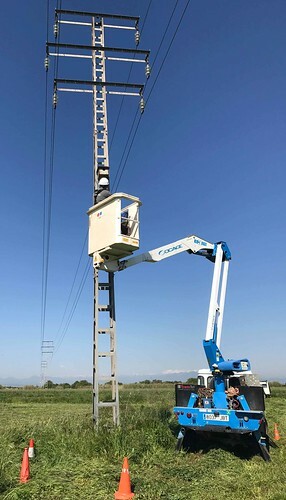 In this context, COMSA Industrial, at the request of Endesa, has installed 35 nest boxes in different electrical power transmission towers throughout the park and has relocated some of the existing nest boxes. Also, after each breeding season, together with the main project researcher, Cristina Fernández, the nests have been inspected to record the reproduction parameters of European Rollers and determine their evolution. In quantitative terms, throughout both years, 166 chicks have been born, of which 124 have been ringed to determine their dispersion. In 2018, 32 nest boxes have been occupied, which is almost 20% more than the previous year, with 21 couples of rollers and eleven of other species. As part of this same Coracias project, COMSA Industrial also collaborates in maintaining the nests that are in the municipalities of Garriguella, Mollet de Peralada and Rabòs in the region of Alt Empordà, Girona. In addition to the roller, these nests are also used by the lesser kestrel, which is the smallest bird of the falcon family. As a novelty, this season, the engineering department has installed camera-traps to detect the presence of nest predators.